There will be some overlaps in this section - does a voiceover actually belong in film or TV? What if a personal appearance is captured on film (as in Tell Me Lies)? This section brings together voiceovers, personal appearances, radio productions and spoken word (records). For the latter, you can find a comprehensive overview of the Argo Records Shakespeare adaptations at John Owen's blog. If that whets your appetite to find out more about Argo Records, a niche marketeer before the term had been invented, you can read more on Folkcatalogue's Blog. Patrick Wymark's radio appearances cover BBC Radio's transition from the Light Programme, Third Programme and Home Service to Radio 2, Radio 3 and Radio 4. 1951 The Barrow Poets Patrick Wymark joined fellow graduates of University College, London in performing poetry at South bank pubs sponsored by the Brewers' Federation. The Barrow Poets continued (without Wymark) up until the 1980's and also recorded with Argo records. 1953 Murder in the Cathedral (LP) Full cast recording of the 1953 Old Vic production. Patrick Wymark as Third Priest. Friday 6 September 1957 Conference on Shakespeare and the Actor, Stratford-On-Avon. Patrick Wymark was one of the actors from the Shakespeare Memorial Theatre answering questions about the relationship between the actor and the audience. Tuesday 8 December 1959 They Met On Good Friday (BBC Third Programme) by Louis MacNeice. Dramatises the Battle of Clontarf in 1014 AD, when 5000 Irish warriors opposed a combined force of 4000 Leinster men and 3000 Vikings. Earl Sigurd (Patrick Wymark) King Brian (Patrick Magee); Music and specially devised sounds by Tristram Cary. (Repeated 8 January 1960, 31 May 1960,). 1960The Wind in the Willows LP (Argo) Narrated by Patrick Wymark with Norman Shelley as Toad, Richard Goolden as Mole, Frank Church as Rat, Tony Church as Badger. Friday 21 April 1961 Woyzeck (BBC Third Programme) by George Buchner by in a new translation by John Holmstrom . Patrick Wymark (Woyzeck) John Sharp (Captain) (Repeated 7 May 1961, 3 March 1962). Wymark had starred in the stage production of Buchner’s Danton’s Death in 1959. Here he plays a poor soldier who earns extra money by taking part in medical experiments and by acting as a servant to the Captain. The Captain equates wealth and status with moral purity. 1961 Twelfth Night (LP)The Marlowe Society and Professional Players Dorothy Tutin, Derek Godfrey, Patrick Wymark as Sir Toby Belch (Argo UK). For a review of this recording see here. Saturday 13 January 1962 Afternoon Theatre: The Children of Saturn (BBC Home Service) by Lydia Ragosin. Patrick Wymark (Gapon), Laurence Payne (Rutenberg) , John Moffatt (Azef).Produced by Charles Lefeaux (Repeated Monday 15 January). The play deals with Russia’s abortive 1905 revolution, instigated by the charismatic priest Father Gapon. Gapon was eventually murdered by Pinhas Rutenberg on the orders of Azef, chief of the battle organisation of the Socialist Revolutionary Party. 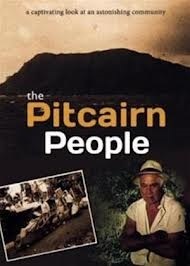 17 December 1962 The Pitcairn People Directed by Peter Newington, written by James Cameron (World Wide Pictures/ British Petroleum). Patrick Wymark delivered the commentary, written by journalist James Cameron to this film about the small island inhabited by the half-Tahitian descendents of the Bounty mutineers. One review found the commentary "informative but conversationally delivered by Patrick Wymark". 1963 The Merry Wives of Windsor (LP)Patrick Wymark as Falstaff, Geraldine McEwan, Roy Dotrice (Argo UK). Sunday 13 January 1963 Churchill: 2: Into Action (BBC Home Service) Patrick Wymark broadcasts by permission of the Governors of the Royal Shakespeare Company (repeated Tuesday 15 January). Friday 9 August 1963 Adventure: Mystery on the Desert (BBC 1) Commentary written by Jacquetta Hawkes and spoken by Patrick Wymark. 30 minute film introducing the Nacza Lines cut in the stony pampa of South Peru. Tony Morrison, Mark Howell and Allan Reditt examine the markings and meet German mathematician Maria Reiche who had spent 18 years trying to uncover their meaning. (Repeated 10 Feb 1965)..
Friday 16 August 1963 Adventure: Children of the Lake (BBC 1) (BBC)In search of a lost civilisation, three young English explorers set out across one of the highest plains in the world -the Bolivian Altiplano. Beneath the brilliant peaks of the Andes they find a village where pre-Incan customs and beliefs still dominate the lives of the people. Commentary spoken by Patrick Wymark. Monday 11 November 1963 Adventure: The Elusive Volcano (BBC 1). Documentary about mountaineer Eric Shipton’s attempt to climb Mount Burney, described as the most southerly active volcano in South America. Commentary written by Richard Wade and spoken by Patrick Wymark. .
Friday 8 May 1964 The Detour (Third Programme) A play by Martin Walser Translator, Richard Grunbergen adapted by Barry Bermange with Patrick Wymark Sheila Allen and Cyril Shaps Produced by Martin Esslin (Repeated Sunday 24 May 1964) Patrick Wymark later appeared in a TV production of the same play.For details of the TV production see here. Saturday 19 September 1964. Biggin Hill Open Day. Personal appearance promoting The Plane Makers third series and the Veetol mock-up. 1964. 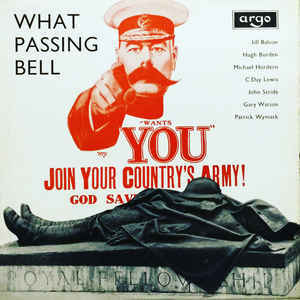 What Passing Bell: A Commemoration in Poetry and Prose of the Fiftieth Anniversary of the first World War (LP) Patrick Wymark (reading Diary Excerpts of Earl Haig), Jill Balcon, John Stride, Michael Horden, Gary Watson (Argo UK). 31 December 1964 Daily Mail Boys And Girls Exhibition At Olympia London. Patrick Wymark and children make appearance at the exhibition (riding The Brainy Train). "A series that looks at the implications of the next 40 years and the probable problems we face in the year 2000, such as over population and automation used in the work place." 28 February 1965. Son et Lumiere at Southwark Cathedral with recorded voices of Patrick Wymark, Peggy Ashcroft and Anthony Quayle. Until 28 April 1965..
Saturday 17 April 1965. Patrick Wymark attended civic reception at Grimsby Town Hall to celebrate his recent best TV actor award. Thursday 20 May 1965. Patrick Wymark appears at Hampstead Festival of the Arts. Sunday 25 July 1965 The Persians by Aeschylus. (Third Programme) A new translation by David Rudkin with Donald Wolfit, Mary Morris, Patrick Wymark, Maurice Denham and John Justin. Produced by Richard Imison. The Times praised “Patrick Wymark’s trumpet-tongued messenger.” Repeated Thursday 19 August 1965, Sunday 10 July 1966. Monday 28 March 1966. Woman’s Hour (BBC Home Service). Patrick Wymark reads the first of nine instalments of Hall of Mirrors by John Rowan Wilson (daily). Tuesday 17 May 1966 The Nosebag (BBC Home Service). A new production of Louis MacNeice’s 1944 dramatisation of an old Russian folk tale with Patrick Wymark as the Old Russian Soldier. Music specially composed for this production by Humphrey Searle. Produced by Francis Dillon. Saturday 11 June 1966Michelangelo, The Divine (BBC 1). Written and adapted by Chrisopher Burstall from N.B.C Films made by Tom Priestley and Lou Hazam. The words of Michelangelo are spoken by Patrick Wymark and the opinions of his contemporaries spoken by Raymond Huntley , Cyril Luckham , Kenneth Farrington and Prunella Scales. Repeated Sunday 30 April 1967. 27 December 1966. Patrick Wymark makes appearance at Daily Mail Schoolboys and Girls Exhibition, with daughter Jane and sons Tristram and Dominic, riding bikes on Cycling Proficiency display. Sunday 29 January 1967. Italy, My Italy Haymarket Theatre, London. Charity Show in aid of the Italian Art and Archives Rescue Fund. Among many stars, Patrick Wymark delivered Launce’s address to his dog Crab from Two Gentlemen of Verona. 1 March 1967. Patrick Wymark and Dennis Vance were announced as being part of the ultimately unsuccessful group led by Professor O.R. McGregor bidding for the Yorkshire ITV contract. 24 May 1967. Patrick Wymark spoke at the Theatre Conference held as part of the first Brighton Festival. Sunday 11 June 1967 Week’s Good Cause (BBC Radio Four) . Mental Health National Appeal by Patrick Wymark. Sunday 4th June 1967. Patrick Wymark opened the new church hall for St Stephens' Church, Roberts Street Grimsby (church demolished 1973 due to structural faults). Wednesday 1 November 1967. British Legion’s Haigh Fund (BBC Radio Four). Patrick Wymark on the work of the fund. Tuesday 23 April 1968 Omnibus: China and the Barbarians (BBC 1) Script by Professor Denis Twitchett and Leo Aylen. Narrated by Patrick Wymark. Film asking why a quarter of the world’s population was cut off from the rest of the world. The programme describes the civilisation with which the West came in contact at the time of the Industrial Revolution, and tells the story of those critical years, from the failure of which we have not yet recovered. 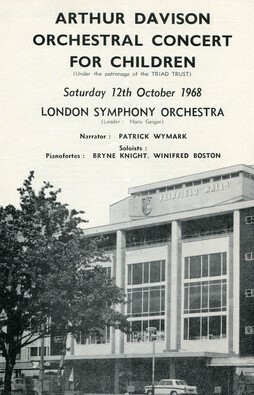 Saturday 12 October 1968 Arthur Davison Orchestral Concert for Children Patrick Wymark narrates the programme, played by the London Symphony Orechestra at the Fairfield halls, Croydon. Sunday 24 November 1968. Movie-Go-Round (BBC Radio 2). Film magazine programme featuring a report from the set of Doppelganger with Patrick Wymark Ian Hendry , Sylvia and Gerry Anderson. Introduced by Peter Haigh. Written and produced by Lyn Fairhurst see here for more details about Doppelganger. Monday 4 March 1968. Woman’s Hour (BBC Radio Four). “from the North of England”. Hallam Tennyson discusses the work of his poet laureate grandfather. Barbara McDonald talks to A Fisherman’s Wife Josephine Gibney of Cleethorpes. “ Northern Guest of the Week; Patrick Wymark”. 12 March 1968. Patrick and Olwen Wymark were guests at a reception for Pierre Werner, the Prime Minister of Luxembourg at 10 Downing Street held by Prime Minister Harold Wilson. Wymark had appeared in the ITV Playhouse production of The Judge earlier that evening. see here for more about The Judge. Sunday 3 November 1968 Movie-Go-Round (BBC Radio 2). On the set of Battle of Britain with Trevor Howard, Patrick Wymark Robert Flemyng , Guy Hamilton.Introduced by Peter Haigh. Written and produced by Lyn Fairhurst see here for more about The Battle of Britain. Saturday 18 October 1969. Verses for Saturday (BBC Radio 2) with the recorded voices of Gary Watson, Patrick Wymark, Prunella Scales and Tony Church. Thursday 20 March 1969 Richard Burton in Profile (BBC Radio Four). Richard Burton recalls his career on stage and screen with comments from Stanley Baker, Harry Secombe, Patrick Wymark and Clifford Evans. Written and narrated by John Doran with research by Steve Swan. Sunday 6 July 1969 Movie-Go-Round (BBC Radio 2). Visitor from Hollywood, Edward Everett Horton. Our Showcase Presentation: Where Eagles Dare starring Richard Burton, Clint Eastwood, Mary Ure, Patrick Wymark, Derren Nesbitt and Michael Hordern. Adaptation by Gordon Gow. Introduced by Peter Haigh. Written and produced by Lyn Fairhurst. 18 March 1970. Patrick Wymark appears at Daily Mail Ideal Home Exhibition. Friday 16 October 1970. Patrick Wymark is guest at Miss Australia QuestPresentation Ball in Sydney prior to transfer of Sleuth to Melbourne. 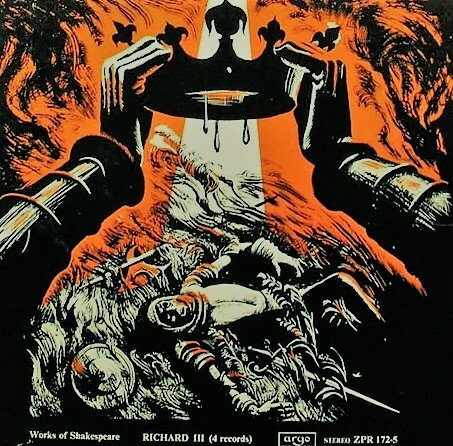 1971 Rudyard Kipling (LP) Patrick Wymark reads Puck’s Song: The Pirates in England, A Smugglers Song, Brown Bess: The Hyaenas, Mine Sweepers. (Argo UK).